When I look at all the promises of the coloring book titles, I’m thinking that maybe I should give it a try… It’s calming. It’s meditative. It leads to happiness. It’s tranquil. It reduces stress. It’s creative. 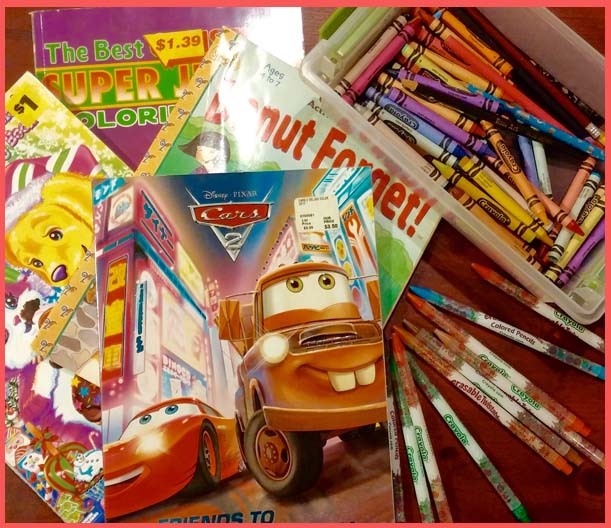 And yet, the thought of coloring — apart from coloring with my grandchildren, which I love, because coloring time is side-by-side giggly, wiggly, silly conversation-filled creativity — stresses me somewhat. How does the thought of coloring stress me? Have you seen those coloring pages?? Oh my! They are so intricate. And you must stay inside the lines. Every line. Every color. All the time. These pictures are so beautiful that going outside the line, even one time, will ruin the picture! These things must take hours to complete, and then what do you do with the finished product? How do you display it? The refrigerator door? I don’t think so, I don’t think I can bump the grandchildren’s art. Do you frame them? Do you just move on to the next page as if all those hours were nothing? Do you ever finish a book? Do you keep it? What will your children do with it when you die? Pitch it in the trash? Stick it in a box? Cry over all the time spent coloring? Maybe I’m over thinking it. Maybe the coloring is the goal, and not the finished product. Maybe it is no more than an enjoyable hobby. I don’t know, I’m sure some of you who color will explain the process and its attraction to me. Until then, I’m watching from the sidelines with lots of questions. How does coloring relieve stress? How does coloring promote calm? How is it meditative? How does it bring tranquility? How does it lead to happiness? How is it more than a distraction? Perhaps for the minutes, hours, or days that one spends coloring, it is possible to set aside thoughts of the stress-inducing and calm-snatching circumstances of life. However, once the coloring is set aside, has anything changed? Does the calm, tranquil, stress-free, meditative happiness that was promised in the coloring book title fade faster than the colors? If our lives are anxiety, worry and stress-ridden, we must pause and ask why. What are we doing, or what are others around us doing that prevent us from living in peace? Is perfect peace beyond our reach? Will a coloring book bring it closer? Once we have found that peace, the thing that will help us to remain in it is to abide in Christ – to live inside the lines. To live within the boundaries that God has established for our safety. Living our very colorful lives within the lines that God has established will lead us to the calm that we crave; the contentment that is our goal. The boundaries that God has drawn for us protect us. The thoughts and behaviors that cross over the wise and good boundaries of God’s design are harmful and therefore induce anxiety, worry, stress and fear. Having boundaries doesn’t mean we are confined to boring, dull and joyless lives. Quite the opposite. It means that we are free to be all that we want to be in safety. We can be colorful, brilliant, subtle, playful – we can stand out or blend in. We can be loud or quiet. Respecting the boundaries provides security. However, when any of us transgresses our boundary, it affects everyone closest to us, and changes the entire picture. Why would I want to go beyond the safety and security of my lines? When I do, I end up in places I was never intended to be, nor was I prepared for, I suffer needless pain and I hurt people I never intended or wanted to hurt. Living within the boundaries of God’s Word and design is how I was created to live, it is how you were created to live. What boundaries are you pushing against? What lines have you blurred? What space do you desire to occupy that God never intended for you? Do you compare your space to other spaces unfavorably? Will you thank God for the space he has given you and commit to not only live within it but fill it with a beautifully colorful life? Lets take our Christian walk one day at a time. I find coloring stressful-not calming. Your post was right on. I turn to God for the calming.